Your donation to PB4H is just one of many solutions to world hunger. Your gift helps us purchase peanut butter for food banks at well-below retail prices and to help distribute peanut-based therapeutic products to countries where acute and moderate malnutrition run rampant. The peanut industry pays for more than 90% of our administrative costs, including this website and our charitable efforts. Generous people like you help us increase the amount of nutritious food going to hungry people worldwide. Peanut Butter for the Hungry is a project of the the Peanut Foundation, designated a (501)(c)(3) charity by the Internal Revenue Service. Contribution to Peanut Butter for the Hungry on behalf of Renee Rye and Sonny Deuell on the joyful occasion of their upcoming nuptials. 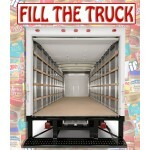 Peanut Butter for the Hungry is collecting donations to supply an entire truck of nutritious, delicious peanut butter to those in need. Wow! Look what we discovered in our archives. 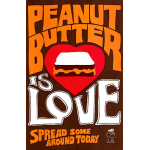 We found these terrific vintage "Peanut Butter is Love" posters from 1969! 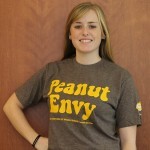 Our super soft Peanut Envy t-shirt will make you the envy of all your friends. If you are not interested in receiving a tee shirt or book, you can make a simple monetary donation to PB4H.